A (k,g)-cage is a regular graph of valency k and girth g and minimal number of vertices. The problem of determining the size v(k,g) of a (k,g)-cage was posed in 1959 by Kárteszi who noticed that v(3,5) = 10 was realized by the Petersen graph. Earlier, Tutte (1947) had already studied cubic cages. Sachs (1963) first showed that v(k,g) is finite, and Erdős & Sachs (1963) gave an upper bound. (i) The (2,g)-cage is the circuit Cg, and v(2,g) = g.
(ii) The (k,3)-cage is the complete graph Kk+1, and v(k,3) = k + 1. (iii) The (k,4)-cage is the complete bipartite graph Kk,k, and v(k,4) = 2k. (iv) If k = q + 1 for a prime power q, then a (k,6)-cage is the incidence graph of a projective plane PG(2,q), and v(k,6) = 2(q2 + q + 1). These graphs have eigenvalues ±(q+1), ±√q, with multiplicities 1, q(q+1), respectively. The (3,6)-cage is also known as the Heawood graph. (v) If k = q + 1 for a prime power q, then a (k,8)-cage is the incidence graph of a generalized quadrangle GQ(q,q), and v(k,8) = 2(q + 1)(q2 + 1). 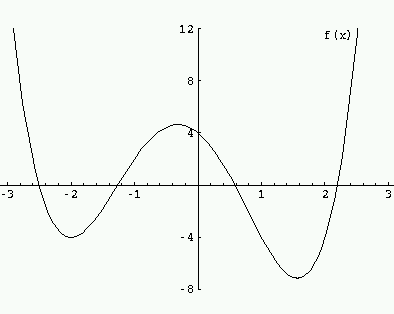 These graphs have eigenvalues ±(q+1), ±√(2q), 0 with multiplicities 1, q(q+1)2/2, q(q2+1), respectively. The (3,8)-cage is also known as Tutte's 8-cage, or the Tutte-Coxeter graph. (vi) If k = q + 1 for a prime power q, then a (k,12)-cage is the incidence graph of a generalized hexagon GH(q,q), and v(k,12) equals 2(q + 1)(q4 + q2 + 1). (Benson) These graphs have eigenvalues ±(q+1), ±√(3q), ±√q, 0 with multiplicities 1, q(q+1)2(q2+q+1)/6, q(q+1)2(q2–q+1)/2 and 2q(q4+q2+1)/3, respectively. Table of all known values of v(k,g) (apart from the above infinite families). The unique (3,3)-cage is the complete graph K4, and v(3,3) = 4. The unique (3,4)-cage is the complete bipartite graph K3,3, and v(3,4) = 6. The unique (3,5)-cage is the Petersen graph, and v(3,5) = 10. The unique (3,6)-cage is the Heawood graph. the incidence graph of the Fano plane, and v(3,6) = 14. The unique (3,7)-cage is the McGee graph, and v(3,7) = 24. The unique (3,8)-cage is the Tutte-Coxeter graph, also known as Tutte's 8-cage, the incidence graph of the generalized quadrangle GQ(2,2), and v(3,8) = 30. There are 18 (3,9)-cages, and v(3,9) = 58. The first such cage was found by Biggs & Hoare (1980), the fact that v(3,9) = 58 and the remaining examples are due to Brinkmann, McKay & Saager (1995). There are 3 (3,10)-cages, all bipartite, and v(3,10) = 70. This is due to O'Keefe & Wong (1980). Two of these three (3,10)-cages are cospectral with characteristic polynomial (x2-9)(x2-6)(x2-2)(x2-1)4(x4-6x2+2)5(x4-6x2+3)4(x4-6x2+6)5. The third, historically the first, found by Balaban (1973), has characteristic polynomial (x2-9)(x2-6)2(x2-5)4(x2-4)(x2-2)2(x2-1)8x2(x4-6x2+3)8. Brendan McKay and Wendy Myrvold showed that v(3,11) = 112 (see McKay-Myrvold-Nadon (1998)), and they showed in 2003 (unpublished) that the (3,11)-cage is unique. This unique (3,11)-cage is due to Balaban (1973). The unique (4,5)-cage is the Robertson graph, and v(4,5) = 19. The unique (4,6)-cage is the point-line incidence graph of PG(2,3), and v(4,6) = 26. Geoff Exoo, Brendan McKay and Wendy Myrvold showed in 2007 (unpublished) that v(4,7) = 67. One example of a (4,7)-cage is known. One has v(5,5) = 30, and there are precisely four (5,5)-cages. One of them is known as the Robertson-Wegner graph. Its group is A5×2 with orbits 10+20. A description: The 30 vertices are the 20 vertices of the dodecahedron and the 10 4-subsets of the dodecahedron that have all internal distances 3; the adjacencies are the obvious ones: the dodecahedron is an induced subgraph of valency 3, each 4-subset is adjacent to its 4 elements and to the antipodal 4-subset. The unique (6,5)-cage is the complement of a Petersen graph inside the Hoffman-Singleton graph, and v(6,5) = 40. The unique (7,5)-cage is the Hoffman-Singleton graph, and v(7,5) = 50. The unique (7,6)-cage is the unique 3-fold cover with girth 6 of the incidence graph of the points and planes of PG(3,2), and v(7,6) = 90. Its group is 3.Alt(7).2. It is the incidence graph of the elliptic semiplane found by Baker (1978). It was rediscovered by O'Keefe & Wong (1981). We give serial number (and actual graph), valency, girth, number of vertices, size of the automorphism group, orbit sizes, distance distribution around each vertex and spectrum. If the graph is bipartite this is stated and only the positive half of the spectrum is given. For these cages one notices that the second largest eigenvalue is much smaller than the largest, there is a big gap there. 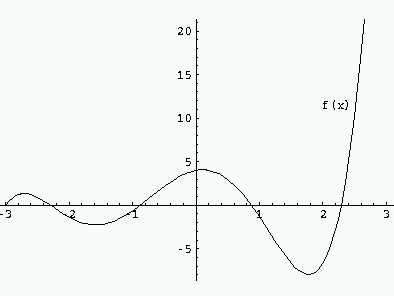 For example, for k=3, g=9 the first graph has spectrum –2.75468 –2.58854 –2.57149 ... 2.34292 2.36066 2.38349 2.38868 3. Looking at all 18 graphs with these parameters, the 2nd largest eigenvalue is at most 2.45953. This can be explained as follows. Let g = 2t+1 be odd. Let Ai be the matrix describing distance i. Put J = A0 + A1 + ... + At + E. Then E is the adjacency matrix of a graph of valency e, where e is the excess of v over the Moore bound. These Ai can be expressed as polynomial in A using A2 = kI + A2 and AAi = (k–1)Ai–1 + Ai+1 for i < t. Now the definition of E becomes E = J – f(A). If λ is an eigenvalue of A different from k, then –f(λ) is an eigenvalue of E, so that |f(λ)| ≤ e. If the Moore lower bound f(k) = v–e for v is more than v/2, then v–e > e and λ is bounded away from k.
For example, in case k=3, g=9, we find f(x) = x4+x3–6x2–4x+4, with f(3) = 46, and the excess is v–f(k) = 58–46 = 12. Now |f(λ)| ≤ e implies –2.913 < λ < 2.517, showing that λ cannot be very close to 3. This argument is due to Biggs (1980), who used it to give a lower bound for e.
The same inequality |f(λ)| ≤ e can also be given in case of even girth. Let g = 2t+2 be even. Put J = A0 + A1 + ... + At + (1/k)B + E, with Ai as before, and B defined by AAt = (k–1)At–1 + B. Again E = J – f(A). Note that E is nonnegative: Bxy is, for d(x,y)=t+1, the number of paths of length t+1 from x to y, so the entries of (1/k)B are at most 1. For example, in case k=3, g=10, we find f(x) = (1/3)x5+x4–2x3–6x2+(4/3)x+4, with f(3) = 62, and the excess is v–f(k) = 70–62 = 8. Now |f(λ)| ≤ e implies –3 ≤ λ < 2.4627. In the examples the largest value of λ is √6 = 2.44949. A.T. Balaban, Trivalent graphs of girth nine and eleven, and relationships among cages, Rev. Roum. Math. Pures et Appl. 18 (1973) 1033-1043. R.D. Baker, An elliptic semiplane, J. Combin. Th. (A) 25 (1978) 193-195. C.T. Benson, Minimal regular graphs of girth eight and twelve, Canad. J. Math. 18 (1966) 1091-1094. N.L. Biggs, Girth, valency, and excess, Lin. Alg. Appl. 31 (1980) 55-59. N.L. Biggs, Constructions for Cubic Graphs of Large Girth, Electronic J. of Combinatorics 5 (1998). N.L. Biggs & M.J. Hoare, A trivalent graph with 58 vertices and girth 9, Discrete Math. 30 (1980) 299-301. G. Brinkmann, B. D. McKay & C. Saager, The smallest cubic graphs of girth nine, Combinatorics, Probability and Computing 5 (1995) 1-13. P. Erdős & H. Sachs, Reguläre Graphen gegebener Taillenweite mit minimaler Knotenzahl, Wiss. Z. Uni. Halle (Math. Nat.) 12 (1963) 251-257. Geoffrey Exoo & Robert Jajcay, Dynamic cage survey, Electr. J. Combin. 15 (2008) #DS16. Geoffrey Exoo, Brendan McKay & Wendy Myrvold, A (4,7)-Cage, preprint, 2007. A.J. Hoffman & R.R. Singleton, On Moore graphs with diameters 2 and 3, IBM J. Res. Develop. 4 (1960) 497-504. L.O. James, A combinatorial proof that the Moore (7,2) graph is unique, Utilitas Math. 5 (1974) 79-84. F. Kárteszi, Piani finiti ciclici come risoluzioni di un certo problema di minimo, Boll. Un. Mat. Ital. (3) 15 (1960) 522-528. B. D. McKay, W. Myrvold & J. Nadon, Fast Backtracking Principles Applied to Find New Cages, pp. 188-191 in: 9th Annual ACM-SIAM Symposium on Discrete Algorithms, Jan 1998. W.F. McGee, A minimal cubic graph of girth seven, Canad. Math. Bull. 3 (1960) 149-152. M. Meringer, Fast generation of regular graphs and construction of cages J. Graph Th. 30 (1999) 137-146. M. O'Keefe & P.K. Wong, A smallest graph of girth 5 and valency 6, J. Combin. Th. (B) 26 (1979) 145-149. M. O'Keefe & P.K. Wong, A smallest graph of girth 10 and valency 3, J. Combin. Th. (B) 29 (1980) 91-105. M. O'Keefe & P.K. Wong, The smallest graph of girth 6 and valency 7, J. Graph Th. 5 (1981) 79-85. J. Petersen, Sur le théorème de Tait, L'Intermédiaire des Mathématiciens 5 (1898) 225-227. N. Robertson, The smallest graph of girth 5 and valency 4, Bull. Amer. Math. Soc. 70 (1964) 824-825. G. Royle, Cubic Cages and Cages of higher valency. H. Sachs, Regular graphs with given girth and restricted circuits, J. London Math. Soc. 38 (1963) 423-429. W.T. Tutte, A family of cubical graphs, Proc. Cambridge Philos. Soc. 43 (1947) 459-474. G. Wegner, A smallest graph of girth 5 and valency 5, J. Combin. Th. (B) 14 (1973) 203-208. P.K. Wong, On the uniqueness of the smallest graphs of girth 5 and valency 6, J. Graph Th. 3 (1978) 407-409. P.K. Wong, Cages - a survey, J. Graph Th. 6 (1982) 1-22.